“Methinks you do protest too much”, said Hamlet. The harhsness with which some people criticize Christianity is revealing. G. K. Chesterton puts it very well in introduction to The Everlasting Man. The point of this book, in other words, is that the next best thing to being really inside Christendom is to be really outside it. And a particular point is that the popular critics of Christianity are not really outside it. … the best relation to our spiritual home is to be near enough to love it. But the next best is to be far enough away not to hate it. It is the contention of these pages that while the best judge of Christianity is a Christian, the next best judge would be something more like a Confucian. The worst judge of all is the man now most ready with his judgments; the ill-educated Christian turning gradually into the ill-tempered agnostic, entangled in the end of a feud of which he never understood the beginning, blighted with a sort of hereditary boredom with he knows not what, and already weary of hearing what he has never heard. … For those in whom a mere reaction has thus become an obsession, I do seriously recommend the imaginative effort of conceiving the Twelve Apostles as Chinamen. In other words, I recommend these critics to try to do as much justice to Christian saints as if they were pagan sages. But … when we do make this imaginative effort to see the whole thing from the outside, we find that it really looks like what is traditionally said about it inside. Get spoken chapters of The Everlasting Man as mp3 audio files here. Especially is it a fundamental thought, from which the exposition is everywhere deduced, that the history of mankind as related in Genesis is in reality nothing else than a system of psychology and ethic. The different individuals, who here make their appearance, denote the different states of soul (tropoi tes psuches) which occur among men. 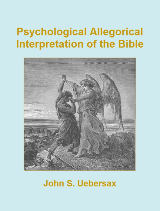 To analyse these in their variety and their relations both to each other and to the Deity and the world of sense, and thence to deduce moral doctrines, is the special aim of this great allegorical commentary. Emil Schürer, The Literature of the Jewish People in the Time of Jesus, 1886, pp. 329-331. He here calls the mind the fountain of the earth, and the sensations he calls the face of the earth, because there is the most suitable place in the whole body for them, with reference to their appropriate energies, a place that nature which foreknows everything, has assigned to them. And the mind waters the sensations like a fountain, sending appropriate streams over each. See now how all the powers of a living animal depend upon one another like a chain. For as the mind, and sensations, and the object perceptible by the external sense are three different things, the middle term is sensation; and the mind, and the object perceptible by the external sense, are the two extremes. (29) But the mind is unable to work; that is to say, to energize according to sensation, unless God rains upon and irrigates the object perceptible by the external senses, nor is there any advantage from the object perceptible to the external sense when watered, unless the mind, like a fountain, extending itself as far as the sensation, puts it in motion when it is quiet, and leads it on to a comprehension of the subject. So that the mind, and the object perceptible by the external senses, are always endeavouring to reciprocate with one another, the one the being subject to the sensations as a kind of material would be, and the mind stirring up the sensations toward the external object, as a workman would do, in order to create an appetite. (30) For a living animal is superior to that which is not a living animal in two points, imagination and appetite. Accordingly, imagination consists in the approach of the external object striking the mind by means of the sensations. And appetite is the brother of imagination, according to the intensive power of the mind, which the mind keeps on the stretch, by means of the sensation, and so touches the subject matter, and comes over to it, being eager to arrive at and comprehend it. He here gives a sketch of the trees of virtue which he plants in the soul. And these are the particular virtues, and the energies in accordance with them, and the good and successful actions, and the things which by the philosophers are called fitting; (57) these are the plants of the Paradise. Nevertheless, he describes the characteristics of these same trees, showing that that which is desirable to be beheld is likewise most excellent to be enjoyed. For of the arts some are theoretical and not practical, such as geometry and astronomy. Some, again, are practical and not theoretical, such as the art of the architect, of the smith, and all those which are called mechanical arts. But virtue is both theoretical and practical; for it takes in theory, since the road which leads to it is philosophy in three of its parts–the reasoning, and the moral, and the physical part. It also includes action; for virtue is art conversant about the whole of life; and in life all actions are exhibited. (58) Still, although it takes in both theory and practice, nevertheless it is most excellent in each particular. For the theory of virtue is thoroughly excellent, and its practice and observation is a worthy object to contend for. On which account Moses says that the tree was pleasant to the sight, which is a symbol of theoretical excellence; and likewise good for food, which is a token of useful and practical good. XVIII. (59) But the tree of life is that most general virtue which some people call goodness; from which the particular virtues are derived, and of which they are composed. And it is on this account that it is placed in the centre of the Paradise; having the most comprehensive place of all, in order that, like a king, it may be guarded by the trees on each side of it. But some say that it is the heart that is meant by the tree of life; since that is the cause of life, and since that has its position in the middle of the body, as being, according to them, the dominant part of the body. But these men ought to be made aware that they are expounding a doctrine which has more reference to medical than to natural science. But we, as has been said before, affirm that by the tree of life is meant the most general virtue. (60) And of this tree Moses expressly says, that it is placed in the middle of the paradise; but as to the other tree, that namely of the knowledge of good and evil, he has not specified whether it is within or outside of the Paradise; but after he has used the following expression, “and the tree of the knowledge of good and evil,” he says no more, not mentioning where it is placed, in order that any one who is uninitiated in the principles of natural philosophy, may not be made to marvel at his knowledge. (61) What then must we say? That this tree is both in the Paradise and also out of it. As to its essence, indeed, in it; but as to its power, out of it. How so? The dominant portion of us is capable of receiving everything, and resembles wax, which is capable of receiving every impression, whether good or bad. In reference to which fact, that supplanter Jacob makes a confession where he says, all these things were made for Me. [Genesis 42:36]. For the unspeakable formations and impression of all the things in the universe, are all borne forward into, and comprehended by the soul, which is only one. When, therefore that receives the impression of perfect virtue, it has become the tree of life; but when it has received the impression of vice, it has then become the tree of the knowledge of good and evil, and vice and all evil have been banished from the divine company. Therefore the dominant power which has received it is in the Paradise according to its essence; for there is in it that characteristic of virtue, which is akin to the Paradise. But again, according to its power it is not in it, because the form of virtue is inconsistent with the divine operations; (62) and what I here say, any one may understand in this manner. At this moment, the dominant part is in my body, according to its essence, but according to its power it is in Italy, or Sicily, when it applies its consideration to those countries, and in heaven when it is contemplating the heaven. On which principle it often happens that some persons who are in profane places, according to their essence, are in the most sacred places, thinking of those things which relate to virtue. And again, others who are in the temples of the gods, and profane in their minds, from the fact of their minds receiving a change for the worse, and evil impressions; so that vice is neither in the Paradise, nor not in it. For it is possible that it may be in it according to its essence, but it is not possible that it should be according to its power. VIII. (36) That then which is shown is that thing so worthy of being beheld, so worthy of being contemplated, so worthy of being beloved, the perfect good, the nature of which is to change and sweeten the bitternesses of the soul, the most beautiful additional seasoning, full of all kinds of sweetnesses, by the addition of which, even those things which are not nutritious become salutary food; for it is said, that the Lord showed him (Moses) a tree, and he cast it into the Water [Exodus 15:25], that is to say, into the mind dissolved, and relaxed, and full of bitterness, that it might become sweetened and serviceable. (37) But this tree promises not only food but likewise immortality; for Moses tells us, that the tree of life was planted in the midst of the paradise, being, in fact, goodness surrounded as by a body-guard by all the particular virtues, and by the actions in accordance with them; for it is virtue which received the inheritance of the most central and excellent place in the soul. (38) And he who sees is the wise man; for the foolish are blind, or at best dim sighted. On this account I have before mentioned, that the then prophets were called seers [1Samuel 9:9. ]; and Jacob, the practicer of virtue, was desirous to give his ears in exchange for his eyes, if he could only see what he had previously heard described, and accordingly he receives an inheritance according to sight, having passed over that which was derived from hearing; (39) for the coin of learning and instruction, which is synonymous with Jacob, is re-coined into the seeing Israel, in consequence of which he, the faculty of seeing, beholds the divine light, which is in no respect different from knowledge, which opens the eye of the soul, and leads it on to embrace the most conspicuous and and manifest comprehension of existing Things: for as it is through music that the principles of music are understood, and through each separate art that its principles are comprehended, so also it is owing to wisdom that what is contemplated: (40) but not only is wisdom like light, the instrument of seeing, but it does also behold itself. This, in God, is the light which is the archetypal model of the sun, and the sun itself is only its image and copy; and he who shows each thing is the only allknowing being, God; for men are called knowing only because they appear to know; but God, who really does know, is spoken of, as to his knowledge, in a manner inferior to its real nature, for everything that is ever spoken in his praise comes short of the real power of the living God. (41) And he recommends his wisdom, not merely by the fact that it was he who created the world, but also by that of his having established the knowledge of everything that has happened, or that has been created in the firmest manner close to himself; (42) for it is said, that God saw all the things that he had Made [Genesis 1:31], which is an expression equivalent not to, He directed his sight towards each thing, but to, He conceived a knowledge, and understanding, and comprehension, of all the things that he had made. It was very proper, therefore, to teach and to instruct, and to point out to the ignorant, each separate thing, but it was unnecessary to do so to the all-knowing God, who is not like man, benefited by art, but who is himself confessed to be the beginning and source of all arts and sciences.